October 27, 2010, filed under Main; Comments Off. Use the matrix to browse accross the Framework/Local Projects: vertically left you can access an intro to each project how it was developped; top right you can review recurent design roles accross all projects; clicking on theimages, you can access a slide presentation of the projects… All together this matrix presentation constitute a first level of the Enabling Kit facilitating the engagement of new Framework/Local Project by design schools and universities. October 3, 2010, filed under Main; Comments Off. 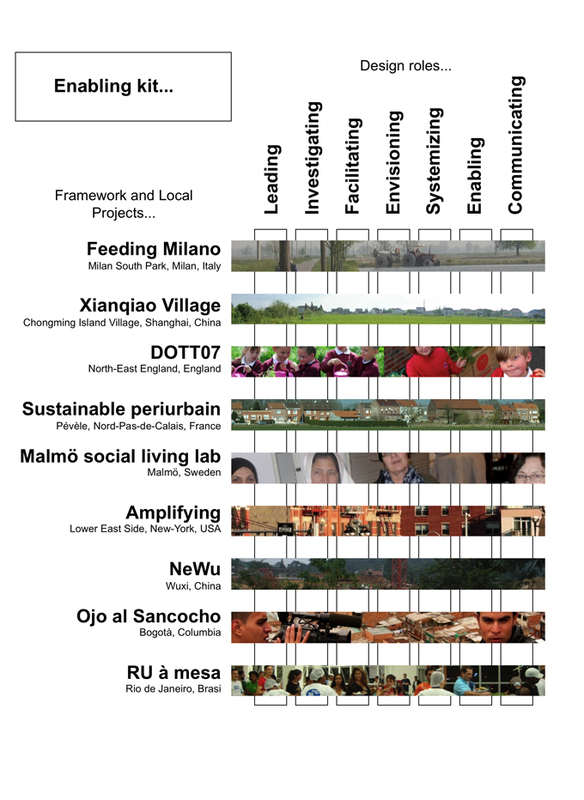 Social innovation for territorial ecology: active communities, distributed systems and design. SEE and SEEK are two programs of the larger PERL initiative. Both are funded from the European Commission for the period 2009-2012. Their common aim is to promote and facilitate Framework Projects as projects that aim to promote and coordinate a multiplicity of self-standing social innovation Local Projects in order to enhance large scale, socially driven, sustainable changes. 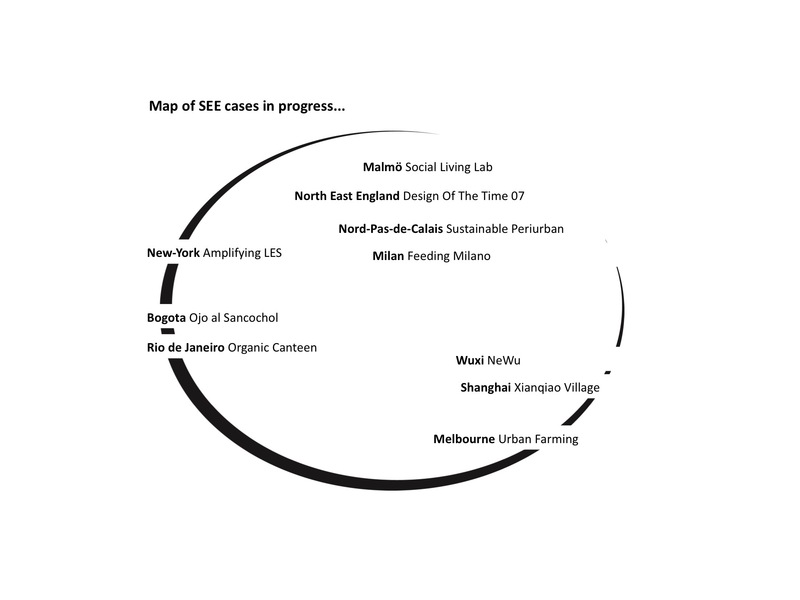 SEE and SEEK are conceived to be (mainly) developed by design schools, in collaboration with other local partners. That is, it considers design schools as agents for sustainable changes. , filed under Main, Network; Comments Off. SEE considers a variety of framework projects with the aim to promote their visibility and to offer the possibility, to different involved actors, to compare and discuss their experiences. In order to facilitate this exchange, it creates an online peer-to-peer platform open to design schools, stakeholders and larger interested audiences. The specific platform is conceived to become a worldwide social network of framework projects promoters and partners, where emerging issues and topics will be posted, compared and debated, where new researches on SEE-related topics will be promoted and where new framework programs and projects will be enhanced. SEEK focuses on a selected number of framework projects and considers with particular attention the design tools that have been used or that are currently in use. On this basis, and considering different clusters of similar programs and projects, it generates some dedicated sets of design tools that we will call: enabling kits. The enabling kits, therefore, are sets of design tools conceived to stimulate and facilitate co-design processes and larger social conversations. That is, to trigger new ideas, support dialogues, promote community building and foster the convergence of different partners. To do that they combine methodologies of user/community-centred design, service design, participate scenario building, solution visualisation, solution simulation and prototyping, real scale experimentation. , filed under Main, Network, Partners; Comments Off. Based on six years of work by the Consumer Citizenship Network (CCN), PERL develops methods and materials to encourage people to contribute to constructive change through the way they choose to live. PERL is contributing to the Marrakech Process on Sustainable Consumption and Production, as well as to the UN Decade of Education for Sustainable Development (2005-2014), with the active participation of UNEP, UNESCO, the Italian Task Force on Education for Sustainable Consumption and the Swedish Ministry of the Environment. PERL is based both in Europe as an Erasmus Academic Network and established in Asia/Pacific, Africa and Latin America. PERL is coordinated from the Hedmark University College in Norway. The Norwegian Ministry of Children, Equality and Social Inclusion also supports PERL. DESIS is a network of schools of design and other institutions, companies and non-profit organizations interested in promoting and supporting design for social innovation and sustainability. It is a light, non-profit organization, conceived as a network of partners collaborating in a peer-to-peer spirit. Strategic Design Scenarios is a consultancy specialised in strategic design, participative scenario building and new product-services system definition. SDS is active in various fields and research projects such as investigating Creatives Communities for Sustainable Lifestyles in China, India, Brazil and Africa for UNEP; exploring immersive service design approach to foster innovation and sustainability in public institutions for the 27e Région in France or building a deliberative platform on nanotechnologies. SDS is consulting for industry and is involved in several national, European and international research projects. Offices are based in Brussels and offer facilities for co-design, interaction with users, video-sketching, rapid prototyping and product-service systems simulation. SDS is responsible for the DESIS Europe network and co-producing the SEP Sustainable Everyday Project. This collection of scenarios and case of social innovations asked: what might everyday life be like in a sustainable society? How would we work, move, and take care of each other? The picture that emerged was that of a ‘multi-local city…based on participative connected citizens”. Last book on the subject: Collaborative services, Social innovations and design for sustainability. October 1, 2010, filed under Design Role Analysis, Leading; No Comments. Leading corresponds to a series of design activities oriented towards conducting or facilitating the overall Framework Programme. Often the Leadership is set up in the original agreements or partnerships at the beginning of the programme, and is often negotiated with the needs and aims of funding and partner institutions. In some case studies Design schools and designers practically lead the initiatives engaging various stakeholders in the programme or in other contexts Design acts more as an overall approach to change that brings together various partners and, eventually, methodologies. Design activities can have also a significant leading role when helping setting up a vision that guide the individual projects in the long term. , filed under Design Role Analysis, Investigating; Comments Off. Investigating is the process by which Local Project (LP) initiatives are searched out and identified as promising. Principally a field activity, investigating comprises mainly of observation and dialogue with players and stakeholders, backed up by a range of visual reporting methods. Information collected is mapped out to situate each project within its own particular system dynamic (constellation of stakeholders and players). Investigating is a qualitative process which serves to reveal both emerging and established LP initiatives. It also applies to the exploration of a context/area as a preamble to proposing future projects. Furthermore, it offers the opportunity to identify potential key players for long-term cooperation to create, consolidate or expand sustainable local networks. The investigating process is principally carried out by design students. Learning basic ethnographic skills to support observation and exchange become part of an active learning process for the participating student taskforces. Findings are assembled, processed and shared in order to provide platforms for determining potential for future actions/partnerships to be developed in the following activity phases.